Ekaterinburg, the capital of the Sverdlovsk region and the administrative center of the Ural Federal District, is Russia’s fourth largest city (1.4 Mio people). It was founded in 1723, and from 1924 till 1991 it was named Sverdlovsk. 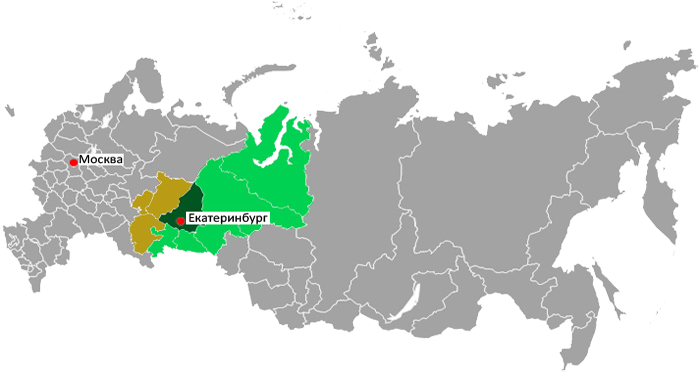 The Sverdlovsk region has a unique and advantageous transport and geographical location at the intersection of regional and global Eurasian continental roads. It is situated at 2.000 km away from Moscow on the border of Europe and Asia, at the crossroads of transcontinental flows of resources, goods, workforce and information. The Ural region is 2 hours ahead of Moscow. The Sverdlovsk region is one of Russia’s most promising territories, an active global trade partner, and a large economic area with high-level business activity, cultural and social life. Out of 83 Russian territorial units, the Sverdlovsk region ranks 5th in terms of the investment potential and 7th in terms of investments in fixed assets. 48% of all investments in fixed assets fall on machinery, equipment, transports, production and household equipment. Today, Ekaterinburg is among the best cities for doing business, a leader in industrial development and one of the most promising cities of Russia. Ekaterinburg is the administrative center of the Ural Federal District, which comprises six territorial units, including four federal subjects of the Russian Federation (Sverdlovsk, Chelyabinsk, Kurgan and Tyumen regions) and 2 autonomous areas (Khanty-Mansi and Yamal-Nenets). The Ural Federal District accounts for 12 million people. The Urals’ capital city actively supports and develops relationships with other Russian cities and foreign countries. Ekaterinburg ranks 3rd among Russian cities in terms of diplomatic representation with 26 accredited consulates, 6 international business and culture development agencies and more than 340 representatives and branches of international companies. The biggest Russian regional airport – Koltsovo - connects Ekaterinburg with 89 locations worldwide and holds strong positions as for the passenger flow and service quality. 40 Russian and international airlines fly to and from Koltsovo. Ekaterinburg has been showing a stable growth in the exhibition sector with 250 exhibitions and conferences held annually. Ekaterinburg-Expo, a state-of-the-art exhibition center with the indoor area alone of 50.000 m² provides an excellent venue to host large-scale international events. Around 30 most significant and efficient exhibitions, including those organized by IEC-Ural, are officially supported by the Government of the Sverdlovsk region and the Ekaterinburg City Administration. Exhibiting in Ekaterinburg is an effective marketing step, which allows you to reach several thousands of professional visitors from numerous Russian regions and abroad. at specialized trade shows in the capital of the Ural region - Ekaterinburg!